A2004NS is a Dual Band 1200Mbps wireless router with 4 Omnidirectional antennae with 5 Gigabit port LAN+WAN. Toto Link A2004NS support multi-wireless modes such as Access point, Repeater, Router, wireless bridge, and WISP mode. Router having 1 USB port to use FTP service, samba service, and URL service. All physical Giga WAN and LAN port provide high-speed endpoint internet delivery, as well as wireless, provide 300mbps in 2.4 GHz and 867Mbps in 5 GHz speed to always connect with and without wireless. Toto Link A2004NS Dual Band Wireless Router Specification. As the post title is about to configuration guide for TOTO link wireless router, but we want to give a brief feature description for the same router with configuration. 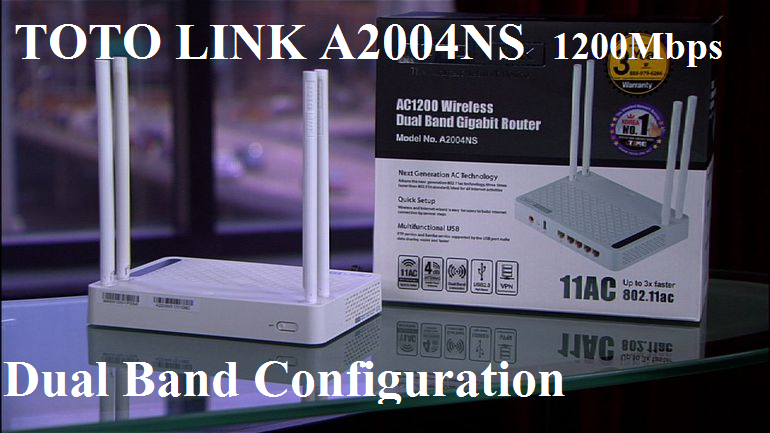 TOTO Link A20004 having 10/100/1000Mbps 1WAN+4LAN Port , 2* 2.4GHz and 2*5GHz Omni antenna to provide seamless connectivity and stability in wireless networks. Router having 1 reset button and 1 WPS button with 1 USB port for file storage purpose. A2004NS size Dimensions (L x W x H) 7.2 x 5.3 x 1.0 in. (182.3 x 133.8 x 25.9 mm). TOTO Link A2004NS software side support all wireless mode and PPPoE, static and DHCP on WAN side. Router can be configured with total 4 wirelesses SSID with 1 Main+ 3 virtual SSID supported with MAC access list.NAT and routing supported with port forwarding and DMZ configuration. TOTO Link A2004NS Dual Band 1200Mbps Wireless Router Connection Diagram. A2004NS dual band router configuration manual for PPPoE or static IP Address type internet. 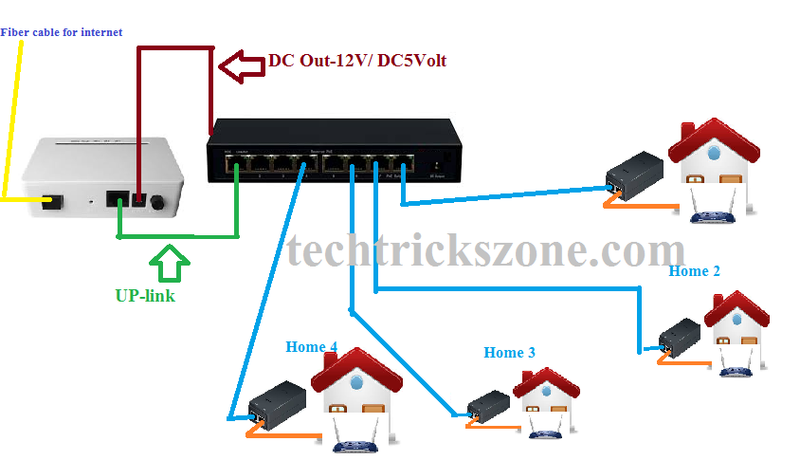 See the Toto Link Wireless router connection diagram for router mode configuration. Connect WAN port to internet cable coming from your internet provider. LAN cable connects to Laptop/ PC LAN port to the configuration. Connect power adapter comes with router box to switch on the router. After Connection Configuration your Laptop/ PC LAN IP Address to make router accessible. TOTO Link A2004NS 1200Mbps wireless router default IP Address is 192.168.1.1 so you have to configure Laptop/PC LAN IP address with 192.168.1.10. To login TOTO Link Wireless router first you should know the default login details. If you buy new Toto link router than you can find default login username and password for your TOTO Link router beside of wireless router. Open the browser and type default IP and hit enter. TOTO-Link A2004 Dual Band 1200Mbps Operation mode. As we already told TOTO Link router support multimode so we have to use router mode to configure Toto link in router mode. 2:- Select Router option from multiple option list. 3: click the Apply button to change operation mode. TOTO-Link A2004NS support static, DHCP and PPPoE mode in WAN configuration. Choose WAN mode type as per your internet servie provider. Suppose if your internet provider given you static IP address details choose static from the list, if PPPoE username password than use WAN type pppoE from the list. am using PPPoE here to configure my router. Click the Apply button to save settings. As the any brand router comes with the default IP address pre-configured so we always recommended to change the default IP address to any other IP address to avoid security lacking in the wireless network. To change LAN and DHCP server configuration follow the steps given below. Subnet Mask – user subnet mask as per IP series you have changed. 3: DHCP Server – DHCP client Range use the IP Address start and End IP Address you want to assign in your network. Apply Setting to save the configuration. TOTO Link A2004Ns is a dual band router with 5GHz and 2.4GHz dual band wireless. For wireless configuration, we have to configure both 5GHz and 2.4GHz wireless setting to make accessible from both 5G and 2G wireless supported devices. 1:- TOTO Link A2004NS 5GHz configuration. First, we have chosen 5.8 GHz radio to the configuration. Pre-shared key- use 5 GHz password in this box. 2:- TOTO Link A2004NS 2.4 GHz configuration. Pre-shared key- use 2.4 GHz password in this box. Click Apply button to save configuration. If you are using TOTO Link A2004NS router with your home and home size not so big then always reduce the Transmitting power of wireless to avoid radiation issue. To change tx power of wireless router you have go in advanced wireless settings as shown given steps. 3:- change the Transmitting power as per your home and office area size. How to Download TOTO Link A2004NS Wireless Router configuration file. Once you have done all configurations so you can save the configuration file to save time use for configuration for next time when your router not working or you did reset. To save the configuration and reload follow the steps below. 3:- Save – Press save button to download configuration file in the computer. Use the browse button to upload configuration file and press upload button. 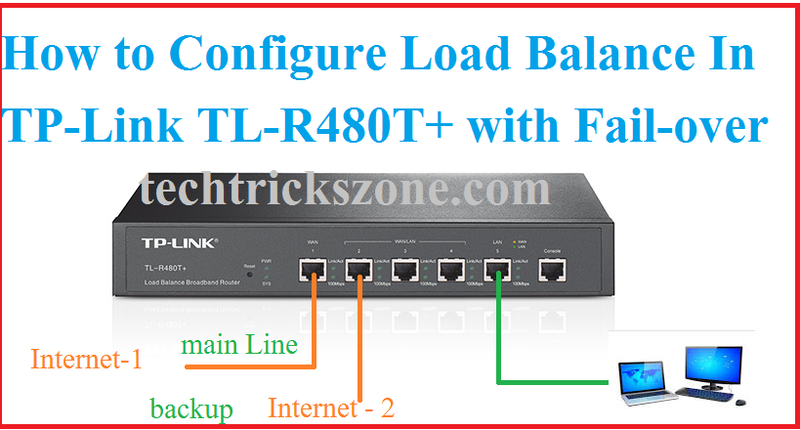 Router will apply configuration file and reboot after reload configuration file. You can access router with IP Address you have use when download configuration file. How to Factory reset TOTO Link A2004NS Wireless Router. To factory reset TOTO link router you have 2 option available. Soft reset with inside web interface. use only when forgot IP Address or username password to access router. To hard reset you have to use reset button available in the router. Just press the button for 3-5 second and see the router unplugged from LAN and reboot. After few second routers will access with default IP address 192.168.1.1. Soft reset only possible if you have access of router web interface. Soft reset means software reset which can do from system option. Reset – press the button and wait for router rebooting. 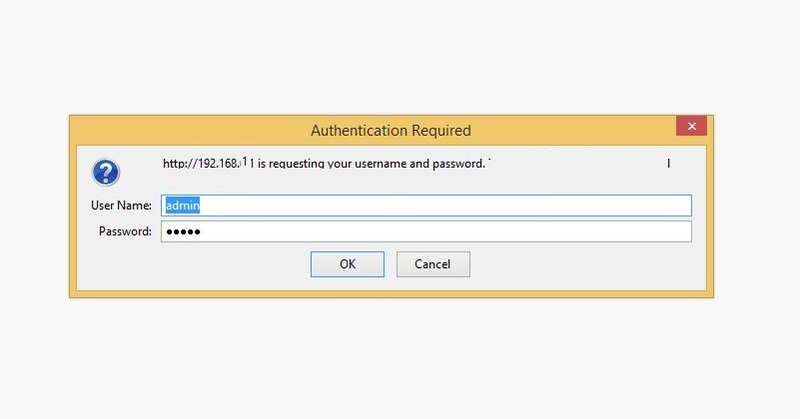 Access router with default IP address and username password as shown toto link router.